Our pictogram language is rapidly evolving. Future linguists will no doubt be shocked that human beings ever communicated with anything as pedestrian as written words. By then, English will have been entirely replaced with an advanced pictographic language–emoji, of course–capable of encoding any object, emotion, concept, or thought in a pithy cartoon sticker. We aren’t there yet, but we just took another baby step closer. Next month, iOS users–which accounts for roughly a billion devices around the planet–will be able to use emoji to convey everything from a bored shrug to a cute, cuddly owl, when the iOS 10.2 update hits iPhones and iPads. Now available as a developer-only beta, iOS 10.2 contains 72 new emoji approved back in June as part of the Unicode 9.0 standard. These include an avocado, a kiwi fruit, a shrugging person (¯\_(ツ)_/¯), an owl, a fox, a duck, a gorilla, a rhino, a call me hand, a selfie hand, a prince (but, sadly, not the Prince), Mother Christmas (whoever that is), a pregnant woman (but sadly, despite emoji’s attempts to diversify, no pregnant man), a literally terrifying clown face perfect for this creepy clown season, an emoji indicating that the sender is in the middle of that most timeless of activities, a full-body ROFL, and many, many more. Also worth mentioning? 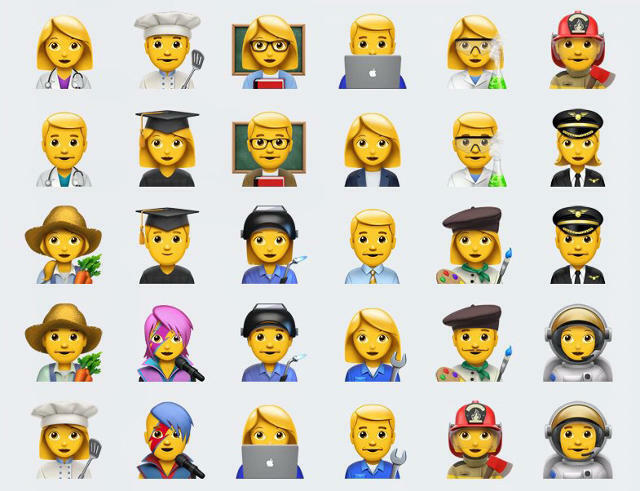 Apple users are now getting the diversified emoji professions previously announced by Unicode, which aim to help end emoji’s sexism problems by making sure there’s a female equivalent for any male figure in the standard. Emojipedia, the go-to resource for all things emoji, expects that based upon past iOS beta releases these emoji will be available on iPhones and iPads everywhere by the end of November, with macOS presumably to get them shortly thereafter (I can’t wait to see a creepy clown line-up on my MacBook Pro’s touchbar). It’s worth noting, though, that Apple is late to getting these emoji, with Twitter, Microsoft, and Google already rolling them out. Still, given the widespread popularity of iOS, it’s likely that iOS 10.2 will be the first time most people will really see them. And what’s next? Next year we’ll get Unicode 10.0, which so far seems largely devoted to making sure you can tell people what Chinese takeout you want to order through emoji. That list of new emoji will likely get fleshed out over time, though. Come to think of it, I’d love a Korean BBQ emoji.